I just got in a very nice Gerhardt Schneider BBb GDR 'stencil'. I haven't been able to list it on my regular 'for sale' page because of a shop computer malfunction. Gerhardt Schneider BBb GDR made by B & S/VMI. Four rotors. 95% lacquer. 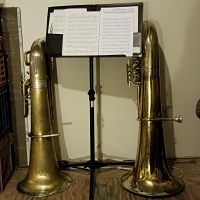 I've serviced this horn for the last fifteen or so years for a very good friend of mine who is downsizing and moving. Comes with Pro-Tec clam-shell gig bag. $2,500. Bump for a very nice horn. Make me an offer. This horn is still available. Make an offer. Bump for a very nice example of a perfectly good tuba. C'mon folks. I've gotta sell this one for a friend. I'm not making anything on it. Make me an offer. It's a good horn!